Other recommended Gildzen books include The Arrow That Is Hollywood Pierces The Soul That Is Me (2011, Otoliths), Outlaw Dreams (2008, Green Panda Press) and The Avalanche of Time: Selected Poems 1964-1984 (1986, North Atlantic Books). Alex Gildzen reads his poem “Tom Mahl Reminds Me” in Elyria, Ohio. “Tom Mahl Reminds Me” comes from Gildzen’s chapbook Elyria: Point A in Ohio Triangle, published in 2009 by Crisis Chronicles Press. 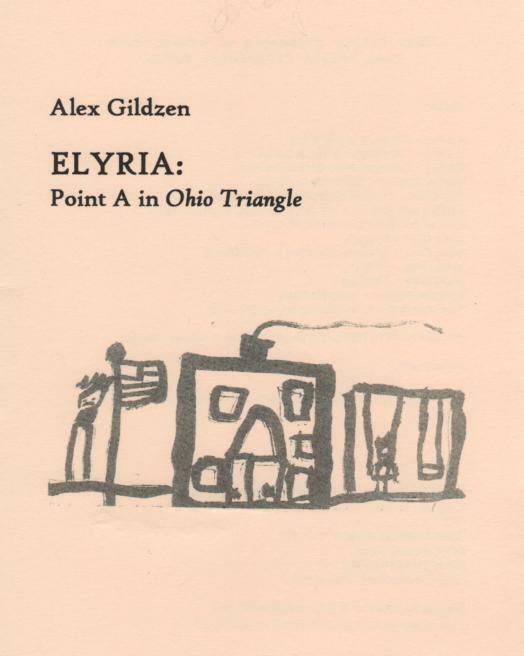 “All in the Eye” comes from Gildzen’s work-in-progress Ohio Triangle, forthcoming in 2014 from Crisis Chronicles Press. For more Gildzen, check out his Outlaw Dreams (2008) and Beth (2009) from Green Panda Press, as well as his The Avalanche of Time: Selected Poems 1964-1984 (1986, North Atlantic Books). Poem by Alex Gildzen recorded on 21 July 2010 at Whitehaven Memorial Park in Mayfield Village, Ohio. “Tracing the Places of d.a. levy” comes from Gildzen’s work-in-progress Ohio Triangle, forthcoming in 2014 from Crisis Chronicles Press. Tres Versing the Panda: Three Days of Poetry Soiree. Filmed by Jesus Crisis. Event sponsored by Green Panda Press (Cleveland Heights) and The Temple, Inc.